PT series screw pumps are a development of the ancient Archimedes Screw principle. The design is of rotary positive displacement and common to all of these pumps is creation of a partial vacuum by the opening and closing or sweeping of a series of voids or volumes. One of the main mechanical issues with screw pumps how to dissipate the high axial forces that are generated by their pumping action, especially as concentric screw pumps are able to develop very high discharge pressures. 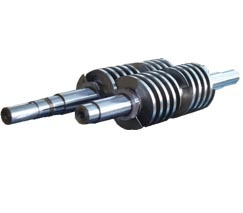 Twin screw pumps use two pairs of counter rotating screw that are driven at their ends by timing gears. These pairs of screw are positioned either side of centrally positioned connection ports. As the counter rotating screws come out of mesh they generate a partial vacuum that is filled by the pumped fluid which is then trasferred from the ends of the pump toward the central deliver port. As this happens symmetrically, the axial loads are perfectly balanced. The main strength of this pump is its robustness. The screws are shorter and very well supported. They are especially popular for moving viscous fluids such as crude oil over long distances or in large bulk quantities for example when unloading large tankers. The triple screw pump design has a different design. It has a single driven, central screw, which meshes with two seperate idler screws. 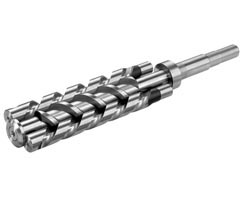 As the meshing screws are relatively long they are extremely efficent and do not suffer the same "slip" problems. Also the design is truly balanced with a small aspect ratio making it suitable for high speed running. Having no timing gears makes the pump more economical to make and simpler to maintain. This also allows the pump to be made in small sizes. Cavitation possibillity is less because of low NPSHr.